An anti-Israel student group at Cornell University told an Israeli student to "quit complaining" about rocket attacks from the Palestinian-controlled Gaza Strip in a Facebook post. 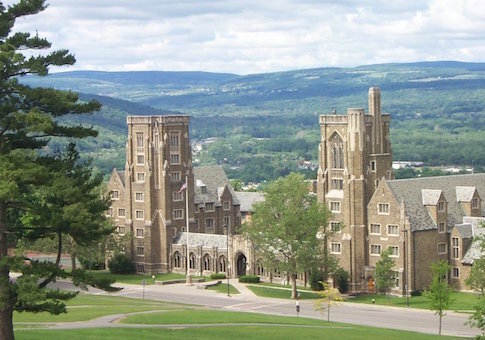 The Cornell Collective for Justice in Palestine (CCJP) made the comments in response to an article from Israeli student Shir Kidron, the College Fix reports. Earlier this month, Kidron wrote an op-ed for the Cornell Daily Sun which recounted a 2009 Gaza missile attack which hit her home and killed her dog. "A mere two seconds after I entered the shelter, I heard a loud boom, and felt my home collapse. After leaving the shelter, I saw the rocket had hit my bedroom and killed my dog Rosie. I was only 12 years old," Kidron wrote. Kidron also highlighted that 40 percent of the children in the Israeli border town of Sderot suffer from PTSD due to the threat of rocket attacks. CCJP responded to the article in a Facebook comment after the group Reject Radicals at Cornell linked to it. "Palestinians have a moral and legal right to use armed struggle to shake of the yoke of occupation. If you want the rockets to stop, end the occupation. Otherwise quit complaining about how it ruined your brunch plans in Ashdod," CCJP posted on Facebook. The Jewish Journal offered additional details about CCJP, noting that they were "one of the groups that signed onto Cornell Students for Justice in Palestine’s February 20 letter to Cornell President Martha Pollack calling on the university to divest from companies that conduct business with Israel, accusing Israel of engaging in ‘apartheid' and ‘ethnic cleansing.'" Last week, a student government resolution calling for Cornell to divest from Israel was narrowly voted down. The student assembly opened the measure to undergraduates in the audience to cast two "community" votes based on its majority opinion. Although a majority of Student Assembly members approved the measure, the resolution failed because the community votes went against it. The final vote, following an almost three-hour debate, was 14 for and 15 against, with one abstention. This entry was posted in Politics and tagged Anti-Semitism, BDS, Israel, Palestinian Authority. Bookmark the permalink.